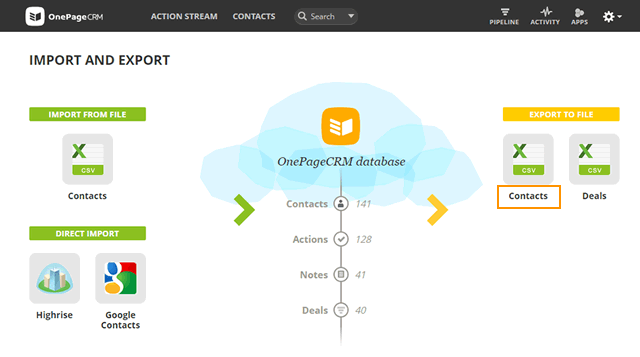 You can export your contacts data from OnePageCRM to a .CSV or .Excel file. Go to gear icon → Import & Export tab. On the Import and Export page → go to the Export to file section and click on Contacts icon. Once on the Export contacts to csv/Excel file page, select export option: export all contacts or export all contacts filtered by Tag, Status, Country, Filter, Lead source, Alphanumeric or Owner. Select your preferred file format, CSV or Excel. Click on Export to start the export. Select all or individual contacts in your Action Stream by checking the box to the left of the contact. In the Bulk Update menu, click on More → Quick Export. On completion, your contacts are downloaded to your computer and saved as onepagecrm_contacts.csv. You can't download contacts to an Excel file from Quick Export. How to export deals from OnePageCRM?